Sept 8, 2011 – What did we learn from last night’s GOP gab-fest in Simi Valley, Cali? 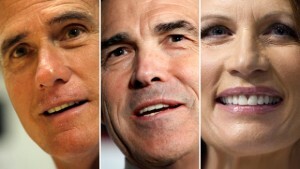 As far as potential presidential candidates, Mitt Romney looks to be losing his grip on the #1 slot, Rick Perry is gaining ground, Michele Bachmann’s numbers are slipping, Ron Paul is getting older, and no matter how smart Jon Huntsman is, no one is picking him – possibly because of the team he played for last year. In fact, the whole ranking of GOP hopefuls is not unlike the Fantasy Football draft which 3 of the 4 Bench Jockeys have participated in for the last 20 years and which took place at the exact same time as the Republican debate. Not a coincidence. Last night, while DVRing the debate, the stars aligned to allow yours truly to snake Ray Rice as the 6th pick of the draft. 6th! Although I had to change draft strategies on the fly, I am thrilled with the opportunity to own Ray-Ray through the 2012 election. Interestingly, four game-tested QBs were selected in the first 13 picks, as a significant percentage of the owners did not want to be saddled with an inexperienced leader at the reigns. Does that perhaps portend the proclivities of the populace? However, the more intriguing development was the way Jamaal Charles (touted by the media as a top five selection) plummeted all the way to pick #11. He was the fantasy equivalent of Newt Gingrich – chock full of spin and promise but ultimately dropping off of the radar when the doubts started to surface. The media can try to establish the market, but a discerning and involved public understands far more than the pabulum that it is fed. As I watched the post-mortem on the debate, I was positively disgusted at the manner in which a purportedly unbiased media portrayed each candidate as hero or villain depending on the particular leanings of each pundit. Make no mistake, the media control the message far better and far more effectively than any campaign manager. The media has the forum and the capacity to bombard the airways with any sound bite, whether favorable or devastating to a candidate, relative to any subject matter. The only way that a voter can make a truly informed decision is through an individualized analysis, and honestly, who has the time to rifle through the interwebs to fact-check every candidate? No one. And that’s exactly what the media counts on. So open up wide, America. CNN, NBC and FOX will keep feeding you their agendas and you can just keep swallowing or, maybe, just maybe, you will come to the voting booths on November 6, 2012 with a well-researched portfolio of facts, data and trend analysis where you can formulate your own decisions about the leadership of this great country. This entry was posted	on Thursday, September 8th, 2011 at 20:35	and is filed under Sport/Pol Crossover, US Politics. You can follow any responses to this entry through the RSS 2.0 feed. You can leave a response, or trackback from your own site. Fact#1-You can’t steal a gift that is given to you. Fact#2-You can’t not believe in Science. Fact#3-Newt is chock full O something. Fact#4-Calling Sociial Security a Ponzi scheme is slapping FDR in the face, and saying he is a criminal. Beyond disrespectful. Powered by WordPress v 4.1.26. Page in 0.903 seconds.